If you always check the sale rail when you're out shopping, looking for a hot buy, then you'll love our dedicated Clearance section at http://homeshopping.24ace.co.uk/clearance. Check out Ace's Clearance Countdown section where you'll find our best bargain buys - end of line stock with incredible low prices. Every item is reduced to clear - save up to 80% on original prices. Ace is a well-established online shopping website with great value gifts, clothing, and homewares, toys, games and much much more. Browse the whole site to find amazing products at truly amazing prices - we offer great value online shopping. Our clearance section features surplus stock, priced to sell fast! Our clearance bargains are updated every day with our latest bargains, you'll find all kinds of gifts, home furnishings, fashion, toys, games, cards & wrap and much much more - so check back every day to see our latest hot deals. 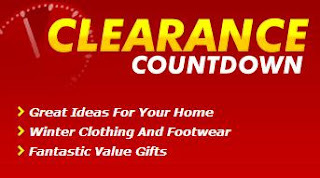 If you love bargain hunting, check out Ace's Clearance Countdown today to see our very latest clearance bargains. We also have a Clearance Countdown Discount Club, exclusively online at 24ace.co.uk where you can get 10% off prices from future Clearance Countdown Leaflets and also get 10% off all the products in our Clearance Countdown section online. Clearance Discount Club...Get An Extra 10% Off Everything. Join Now!